This photo has me slightly puzzled. 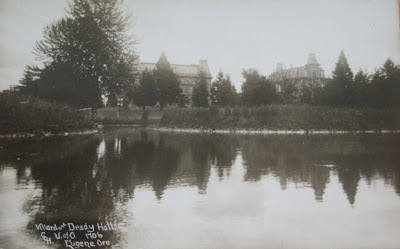 It is a view of Villard and Deady Halls taken from the West/North West probably about where the Phoenix Inn stands today. I assume the body of water in the foreground is the Millrace but it looks more like a pond or even a small lake to me. Perhaps that section was made considerably smaller when it was "canned up" under Broadway. It's such a shame that in the late 1940's when the Robinson Theater was constructed that it couldn't have been built away from Villard Hall instead of tacked on like a conjoined twin forever marring the once beautiful west facade.